This park was created between 1935 and 1940 by members of Civilian Conservation Corps company no. 2822, one of many such units organized by the federal government during the great depression to provided useful employment for thousands of young men and to develop and conserve the nation's natural resources. Company 2822 consisted of about 200 men who where housed in wooden frame barracks on a site just north across the road from the boiling springs, under the management of United States Army personnel. The men were paid a small amount ($30.00 to $45.00) per month and also received housing, food, medical and dental care as well as education if they needed of desired it. The young men built the park roads, planted trees, constructed a swimming pool bath house, water towers and the large stone community building which stands at the east end of the park. Company 2822 left a permanent memorial to the service of its members in the form of this beautiful park which has served countless millions of visitors. Dedicated to and paid for by the Members of Co. 2822 CCC on the 30th anniversary of the company's founding and the beginning of this park. 1 mile N on Hwy 34, then 5 miles E on Hwy 34C. Inside Boiling Springs State Park in front of the Boiling Springs and Park Information Office. The Civilian Conservation Corps (CCC) was created on March 31, 1933, in President Franklin D. Roosevelt's first month in office. The CCC was an interdepartmental work and relief program that sent young, unemployed men from the cities to work on conservation projects in rural areas at a dollar a day. The CCC is credited with constructing many buildings and trails in state and national parks still treasured today, and other work related to land conservation, etc. 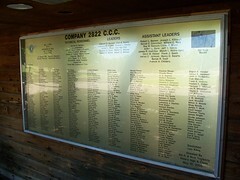 The Civilian Conservation Corps Alumni web site. The Civilian Conservation Corps (CCC) was a public works program that put over three million young men and adults to work during the Great Depression of the 1930's and 1940's in the United States.